Podiumwear founder and CEO Reid Lutter has been nordic ski racing for 40 years and nordic coaching for 30 years. He founded the National Nordic Foundation, a fundraising non-profit that benefits U.S. development programs, and now sits on its Board of Directors. He has coached National Champions, an Olympian as well as the U.S. Ski Team's World Junior Championship team twice. Reid is still actively involved in coaching and advising within the nordic community. 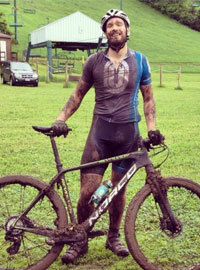 Reid started Podiumwear in 2003 after many frustrating experiences as a coach ordering custom apparel for his own team. Knowing he could do better, he founded Podiumwear to provide concierge-style customer service, fast turn-around time and high quality Made in USA team nordic apparel. Reid has since expanded Podiumwear to include custom team apparel for cycling, alpine skiing, running, ultimate frisbee and, most recently, soccer. Kristine is our product guru. She has over 10 years of experience in the technical apparel industry and is an expert at sourcing the best fabrics and trims from around the globe, fine-tuning that perfect pattern and putting it all together for a superb technical garment. 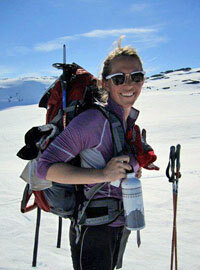 Kristine comes from a background in fine art, design and technical apparel development. She is particularly excited about the opportunity to bring women-specific technical apparel up to the standard of men's. She's crazy good at what she does and wears a smile while doing it. Gotta love that! She's also a mighty fine cyclist (mountain, road and gravel), yogi and alpine skier. Her latest adventure is being a new Mom. Jessica stepped into a sales and marketing role when Podiumwear expanded in 2010. With experience in sales and customer service, an extensive background in alpine racing (a former junior national champion) and the ability to work peacefully with family members (Kristine is her sister and Reid is her husband), she wears many hats (and alpine suits) with ease. When she is not managing marketing efforts, writing blog posts or scouting special projects, she can be found on her road bike, on her yoga mat, running, skiing or gardening. She is also mother to two very busy teenagers. 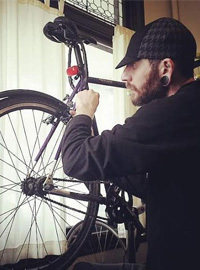 Anyone who has met or even briefly encountered Aaron knows that cycling is his passion. He lives and breathes cycling and the community surrounding it. When it comes to the industry, has done it all: Salesman, Manager, Fit Specialist, Race Director, Blogger (The Minneapolis Musette) and Local Community Torchbearer. It makes sense that he'd find himself at a cycling apparel maker that manufactures everything in his own community - it's a perfect fit (no pun intended). Hailing from Hutchinson, Minnesota - Aaron is deeply addicted to social media, fancies road bicycles in off road situations, sleeps soundly and is "fully stoked" about becoming a Dad. Born in St. Paul, Derek is a Twin Cities kind of guy. After studying Architecture and Design in College, he found his passion in Graphic Design. Derek has been a designer within the Twin Cities for over 10 years, working with a range of companies, from major corporations to small businesses just getting their feet off the ground. He has experience in marketing and sales, but is not afraid to get his hands dirty. In fact, on his first week at Podiumwear he helped Reid fix our sublimation printer, inked up hands for days. By far his favorite place to get dirty is on the trails. Derek loves his Minnesota sports, he is a cyclist, a nordic skier, a hockey player and will pretty much throw down to play any competitive sport with you right now. That's a challenge. Derek has traveled the world, played a lot of sports and worked for some great companies, but his favorite thing is his new adventure of being a parent. Robbi grew up on a small farm just outside of Stillwater, MN. She got her degree from the University of Wisconsin, Madison and now considers herself a lifelong Badger. Before joining Podiumwear, Robbi worked in editing, marketing and design in the world of Academia. She is an enthusiastic biker and a wannabe distance runner (when there's no snow on the ground). Otherwise, she's a die hard nordic skier with a chronic case of Birkie Fever. She also helps coach the Stillwater Nordic ski team and the St. Croix Valley Ski Club. When she's not busy with all of that, she can be found planning her next travel adventure, drinking beers with friends or working on restoring the little old dilapidated farmhouse she and her husband recently bought.